ensuite facilities on the second level floor. One room with a double bed, the other with two single beds. Possibility to add another real single bed if necessary. It is ideal for family groups or for larger parties. All the rooms are South facing and therefore sunny throughout the day. 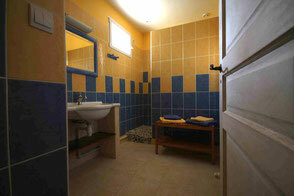 All rooms have all been renovated to a high standard. Included in the price of the breakfast, access to the pool , access to outdoor play ground.